THIS IS AN IMPORTANT MESSAGE FROM THE LYNNFIELD OFFICE OF EMERGENCY MANAGEMENT. Snow continues to fall in Lynnfield and will continue through out the day, with blowing and drifting snow. A blizzard warning continues in effect through 1AM Wednesday. Twelve plus inches of snow has already fallen with potential accumulations totaling two feet or more. Because the snow is the light fluffy variety we have yet to experience power outages. We are continuing to staff the emergency shelter at the Middle School 505 Main Street Lynnfield. This shelter is not able to accommodate pets. The snow emergency remains in effect including a town wide parking ban and travel ban. Vehicles parked on the street will be towed. Please stay off the roadways. There will be no trash collection Tuesday. Please use care if using generators, Never run a generator indoors! Exhaust from a generator produces deadly carbon monoxide; exhaust should be directed away from the building. If your furnace has a direct vent (vents out the side of the house rather than a chimney) there is the potential that this vent could become blocked by drifting snow. If safe to do so, you should check these vents to ensure they are clear. Any utility wires on the on the ground or hanging low should be considered live and should not be touched or moved. Public works crews have worked through the night to keep roadways open and passable for emergency vehicles. If you are in need of assistance or need transportation to the emergency shelter, you can call 9-1-1. Future updates on this storm will be posted as the situation develops. A dangerous and potentially historic winter weather event is forecast for Lynnfield beginning Monday afternoon. Heavy snow is expected, beginning late this afternoon, at a rate of 2-4 inches per hour, with blowing and drifting snow. A blizzard warning is in effect beginning 7pm Monday through 1pm Wednesday. Forecasters are predicting two or more feet of snow, damaging winds, and plummeting temperatures. Widespread power outages are expected with outages lasting 72 hours or more. Lynnfield will be opening an emergency shelter at the Middle School 505 Main Street Lynnfield, at 7pm Monday Jan. 26, 2015. This shelter is not able to accommodate pets. A snow emergency has been declared. A Town wide parking ban is in effect beginning at 7pm this evening, vehicles parked on the street will be towed. Please stay off the roadways. A travel ban for non-essential travel is in effect starting at midnight. Trash collection for Tuesday has been cancelled. Please use care if using generators, Never run a generator indoors! Exhaust from a generator produces deadly carbon monoxide; exhaust should be directed away from the building. If you are in need of assistance or need transportation to the emergency shelter you can call 9-1-1. 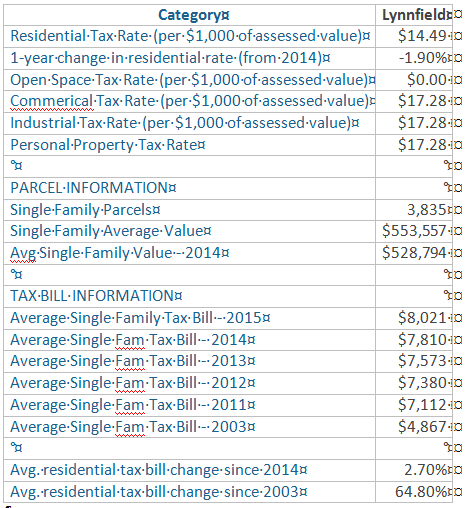 The Boston Business Journal published municipal tax statistics from the MA Dept of Revenue today. The following are for Lynnfield. For those that weren’t able to attend Tom Terranova’s November 25, 2015 Walnut/Salem Street Town Meeting will be broadcast on Lynnfield’s Public Channels (Comcast 9 and Verizon 28) Wednesday January 14th through Saturday January 17th and Wednesday January 21st through Sunday January 25th at 2:30 PM and 9 PM. Recently, I joined in the Open Meeting Law [OML] Complaint filed in Superior Court alleging that our Board of Selectmen [BOS] have, by their pattern of behavior, both technically and in spirit, disregarded that law designed to assure "…that meetings of public bodies be open to the public…" [Atty General's Open Meeting Guide]. While I have always been reluctant to seek outside help in resolving Lynnfield affairs, the attitude of the BOS as expressed by Chairman Nelson during their meeting on Nov 3, 2014 to present an "Update on Town Administrator Search" was just too much to take. Not only was the Agenda item misleading and insufficient notice, when asked to permit public input to the selection of the applicant(s) for Town Administrator, Chairman Nelson stated that the public was there to observe and not participate. Essentially this means the public had no input concerning a position that is not elected, is immune from the OML and yet substantially affects the vast majority, if not all, of Town affairs. Furthermore, Town Administrator business is conducted in private without public oversight. I realized, based on this and prior similar events, the only way to get the BOS’ attention and change their behavior was through outside intervention. I do not believe, that once elected, the Selectmen should hubristically ignore the public they are sworn to serve. Our long standing form of Lynnfield Government is founded on public participation through Town Meeting and open public input to that government through the various Boards and Committees. Most, if not all, of the various other Town Boards and Committees follow this practice and until April of 2013, the BOS consistently did the same. Now the BOS ignores this history and perverts the true intent of the OML when following it is not "convenient", often choosing to "hide" behind the Town Administrator OML immunity shield through individual Selectman/Town Administrator private meetings. If, as citizens, we believe in our traditional form of government then we have to protect it when it goes awry and take steps to bring it back on track even if this process is uncomfortable. If this is not what we want, we should promote and vote for a Charter revision which supports a different type of governance. My purpose and hope is that the BOS will encourage and embrace this most basic democratic principle and open up all their proceedings, and those of the Town Administrator, to active open public participation/input. This joint government/citizen collaboration will provide the best resolutions to the issues that affect our Town life. Received this from the Board of Seelctmen email list. Not sure what it is about other than they are planning to expand the gasline that runs through parts of Lynnfield. Would suggest contacting the Selectmen. Tennessee Gas Pipeline Company, L.L.C. (“TGP”) is planning to expand its existing pipeline system to serve the growing demand for interstate natural gas transmission service in the northeastern United States. The Northeast Energy Direct Project (“Project”) is being developed to meet the growing energy needs in the Northeast and, more specifically, the New England region. TGP plans to host open houses in January and February, 2015 for the portion of the Project located from Wright, New York to Dracut, Massachusetts (referred to as the market path component of the NED Project), and in March-April, 2015 for the portion of the Project located from Troy, Pennsylvania to Wright, New York (referred to as the supply path component of the NED Project) to provide additional information and answer questions concerning the Project. Please find the details of our open houses scheduled in January and February below. All open houses are from 6pm-8pm. Light buffet will be served. Landowners will receive notification of the open houses via mail, and ads will be placed in local newspapers to inform the general public. 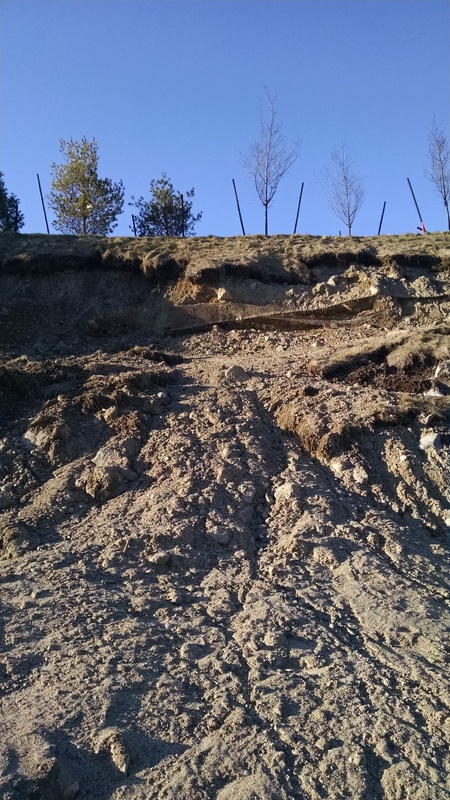 Recent heavy rains have eroded the berm. 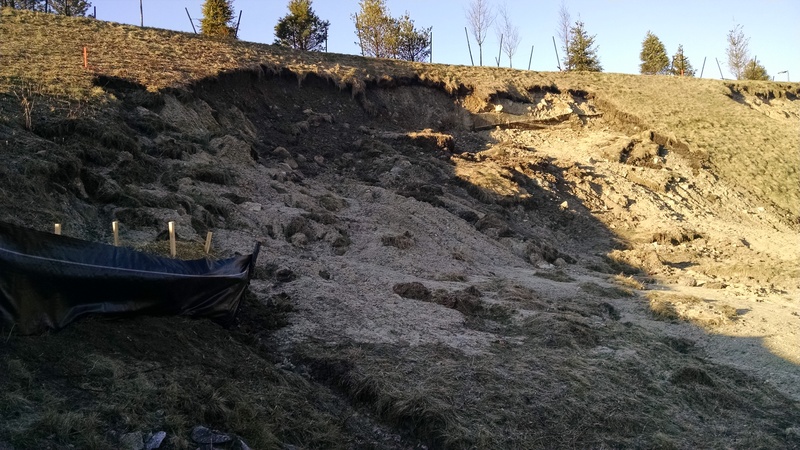 Dirt collapsed into what appears to be wetlands. Hope Planning Board and Conservation Commission will make sure that issues are fixed.